On Jan. 11, 2017, Houston mayor Sylvester Turner sent in SWAT to solve long-standing drainage problems across the city. But instead of carrying out high-stakes military operations, this SWAT — the cleverly named Storm Water Action Team — will commence work on approximately 100 deferred projects focused on maintaining and upgrading Houston’s aging flood management infrastructure. The formation of the team represents the first large-scale project spearheaded by Stephen Costello, who was appointed Houston’s “flood czar” last April following regional flooding that killed at least eight people and affected around 2000 residences. Prior to the plan’s announcement, potential rehabilitation efforts were prioritized based on the frequency of 3-1-1 calls and historically vulnerable areas to flooding. 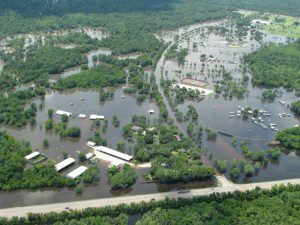 Rather than constructing new infrastructure, SWAT will focus on drainage problems not directly attributable to overflow from the city’s nearby bayous, which are under the jurisdiction of the Harris County Flood Control District (Houston).